User Phone Number Already Exist. Please enter password and confirm password!! You are successfully Registered with EaseMyTrip. Refer to Win Exciting Prizes! Enter Your Email Address/Mobile No. Your Email ID or Password is incorrect. * Enter a valid Email or Phone Number. Hi, To complete the registration process, please click the link in the email we just sent you. Thanks for registering with EaseMyTrip, To complete the registration process, please click the link in the email we just sent you . * Password does not match the confirm password. Thanks for registering with EaseMyTrip. "Your OTP has been expired"
Enter a Email Address or Mobile Number. Your password has been changed successfully! Thank you. Your OTP has been sent to your Mobile Number Kindly check your Mobile. Your OTP has been sent to your Email ID Kindly check your Mail. How do you get it? 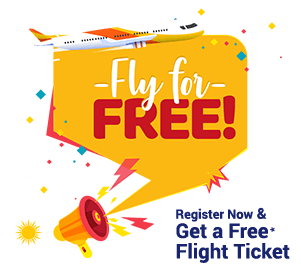 To avail the offer, users have to search flights for the respective domestic destinations and must enter Promo Code: EMTEXTRA in the promo code field to enjoy additional discount. The offer is not valid for Infant bookings and group bookings. Fares are subject to change without prior notice. In the event of any misuse or abuse of the offer, EaseMyTrip reserves the right to deny the offer to the customers. 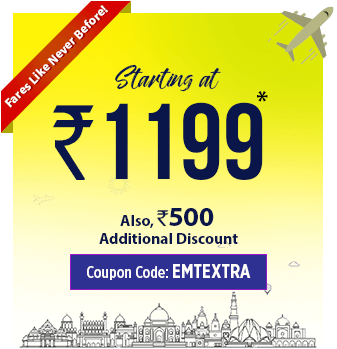 EaseMyTrip is the sole authority for interpretation of these terms. In the event of any dispute, Courts of New Delhi will have jurisdiction. Travel agents by profession are barred from this offer. EaseMyTrip reserves the right, at any time, without prior notice and liability and without assigning any reason whatsoever, to add/alter/modify/change or vary all of these terms and conditions or to replace, wholly or in part, this offer by another offer, whether similar to this offer or not, or to extend or withdraw it altogether. EaseMyTrip shall not be liable for any loss or damage arising due to force majeure.